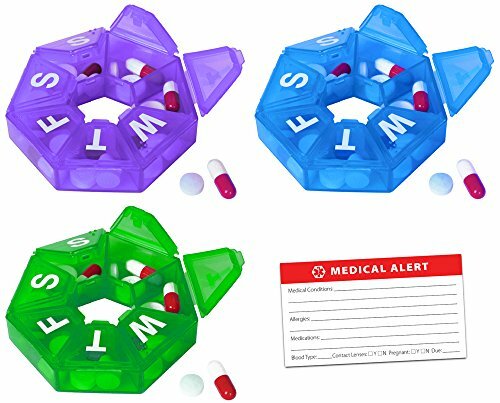 This great 3 pack of seven sided pill organizers are a compact design each with a compartment for each day of the week to help remember daily medications. This pack comes with one each of Blue, Purple & Green. Use the different colors to designate the person or use to distinguish medications taken at different times of the day. The cases are designed to resist popping open in your purse, briefcase or suitcase. Each compartment holds 10 aspirin size tablets. See-through design lets you see if today's pills have been taken without opening. Durable plastic, marked with each labeled in large print and braille for each day of the week. Each Pill Organizer Overall size: 3" wide x 5/8" tall Individual Compartment Approx: 1 1/4 long at the longest & 1/2" at the shortest x 3/4" wide x 1/2" deep. Comes with medical alert card so you can keep all your important medical information on you in case of emergency. This wallet size card is 2" x 3.5" with space for your: Medical Conditions; Allergies; Medications; Blood Type; Contact Lense Wearer; Pregnant. The back side is for your Contact & Personal Information including Doctor, Hospital and Insurance information. Three multi color pack of our convenient weekly pill organizer. Use the different colors to designate the person or use to distinguish medications taken at different times of the day. Seven sides, each labeled in large print and braille for each day of the week. Comes with medical alert card so you can keep all your important medical information on you in case of emergency. This wallet size card is 2" x 3.5" with space for your: Medical Conditions; Allergies; Medications; Blood Type; Contact Lense Wearer; Pregnant. The back side is for your Contact & Personal Information including Doctor, Hospital and Insurance information. If you have any questions about this product by Pill Thing, contact us by completing and submitting the form below. If you are looking for a specif part number, please include it with your message.